Iberic was the fourth of Shaw, Savill & Albion's "I" class of freighters, the first three being Ionic III, Illyric and Icenic. (Iberic differed significantly from her sisters, though, in that she was the only one of the four built to carry 275 tons of tallow or edible oil in bulk.) She was built at Alexander Stephen & Sons of Glasgow -- the first ship built for Shaw Savill in that yard since 1921 -- with engines built by Harland & Wolff, Belfast. 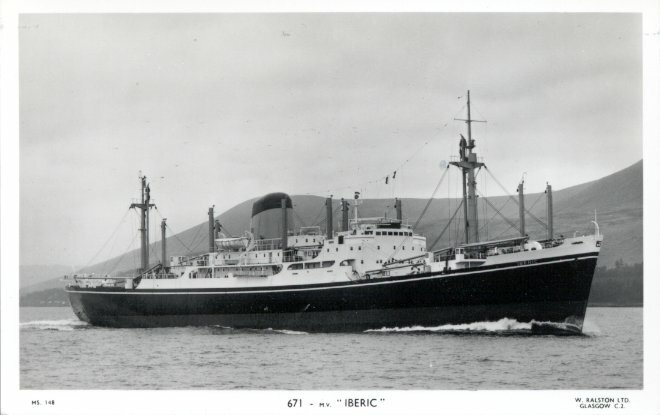 Launched in November, 1960, Iberic was completed in April of the next year. In addition to serving on Shaw Savill's traditional England-to-New Zealand route, in 1965 Iberic made at least one voyage on the so-called "MANZ" service from Australia and New Zealand to the Gulf and Atlantic coasts of the United States and Canada and then back to New Zealand. In 1976, still owned by Shaw Savill, she was placed in the service of her owner's sister company, Royal Mail Lines, and renamed Deseado. The ship was sold in 1980, to the Metcalfe Shipping Co., retaining the name Deseado, and again in 1982 to Maistos Wind Shipping Co., which renamed her San George. After being laid up for a time at Falmouth, she was broken up at Chittagong, Bangladesh, in 1983.